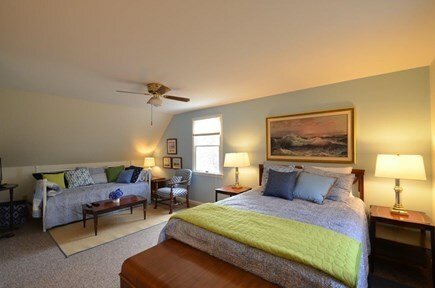 Classic Cape In East Chop Highlands-Minutes From Oak Bluffs! Welcome to OB! 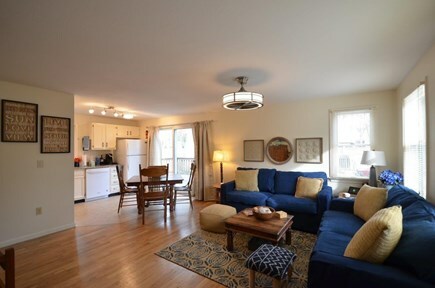 Close to ferries & walk to Circuit Ave! Your relaxing Vineyard retreat is just beyond this front door. Rocking chairs & settee make for intimate conversation or nap! Living room with ceiling fan & comfortable conversation area. House has Wi-Fi, bring your Amazon & Netflix info! 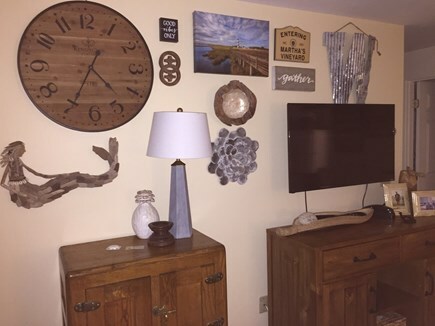 Living room gallery wall with 4K HD TV. Open Kitchen with sliding doors leading to deck. 1st floor bedroom with Queen bed. 1st floor Queen bedroom sitting area. 1st floor bedroom with twin beds. 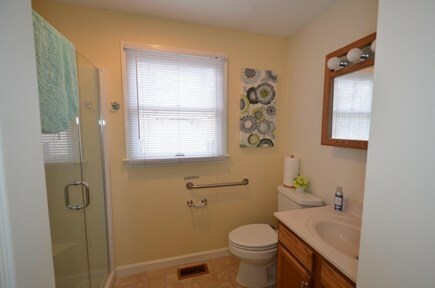 First floor bath with walk-in shower and stackable washer/dryer. 2nd Fl Queen Master-size suite with lounge area and 4K HD TV. Sitting area in 2nd floor bedroom. 2nd floor shared bath with bathtub. 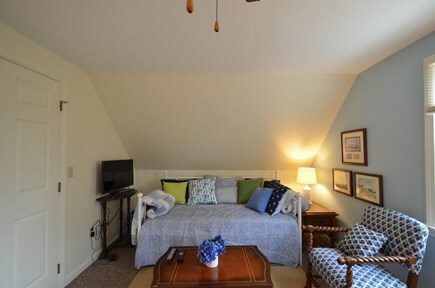 2nd floor Full Master-sized suite with sitting area and 4K HD TV. 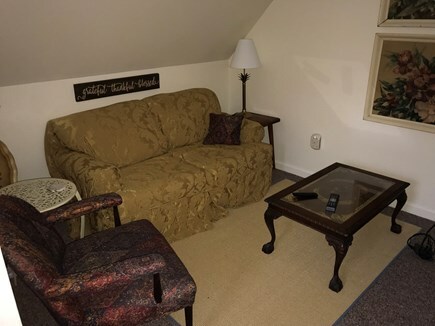 2nd floor Full Master-sized suite sitting area, TV on wall. Dine al fresco on the deck! Weber grill in backyard. Deck with ample seating, outdoor shower too. June 29-July 6, July 6-July 13 just reduced by $200 per week! 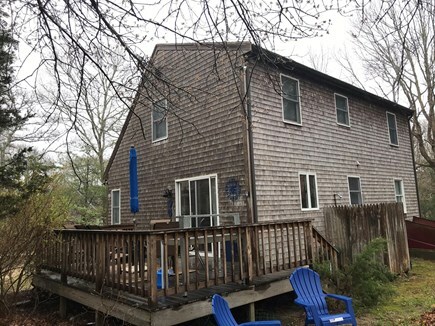 On a quiet, wooded, residential street, this comfortably furnished four bedroom home in East Chop Highlands is centrally located, within walking and biking distance of downtown Oak Bluffs shops & restaurants and easy access to OB Harbor, East Chop Lighthouse, East Chop Drive, Flying Horses Carousel, Oak Bluffs Ferry Ports and beaches. Drive from the Oak Bluffs Ferry Terminal in about 5 minutes, from Vineyard Haven Ferry in less than 10 minutes! MV bus stop is a 3 minute walk from corner! 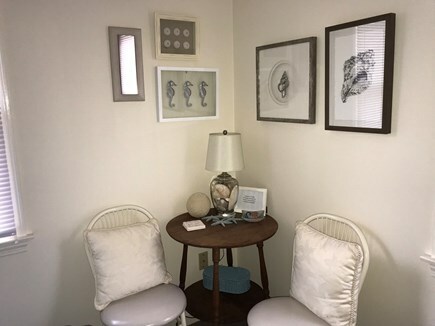 The open first floor living & dining area with hardwood floors leads to the private sun deck and good size back yard with private outdoor shower. Living room area has flat screen 4K-TV. Open kitchen features granite countertop, tile floors and pantry. First floor includes a bedroom with twin beds, another with a queen bed--across the hall is a full bath with stackable washer/dryer. 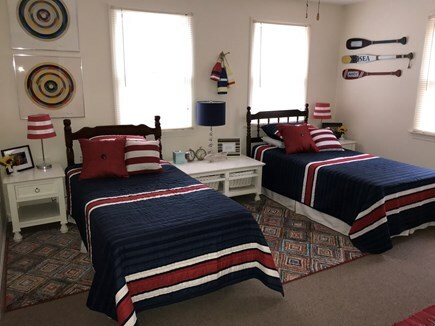 Second floor has two master-sized bedrooms with a 'B & B' feel, one with a queen bed the other with a full bed--each with separate lounge/seating areas and flat screen 4K-TV'S and shared full bath. All bedrooms have AC and ceiling fans! Enjoy the rocking chairs on the Farmer's Porch for morning coffee or afternoon cocktails or choose the Sun Deck (seats 6+) for dinner or lounging. Plenty of parking for at least 4+ cars! 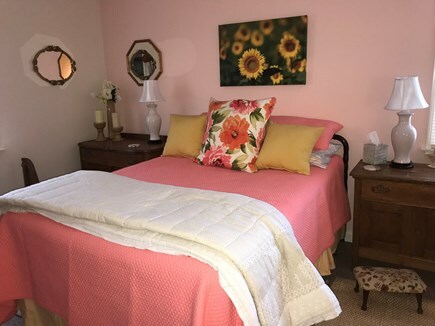 Additional pricing info: $250 per week cleaning fee, $500 refundable security deposit after 30 days, linen service optional, State and local taxes of 11.7% will apply. ADA/Wheelchair Accessible: includes discreet ramp along side of house to deck allowing access to first floor through sliding doors. 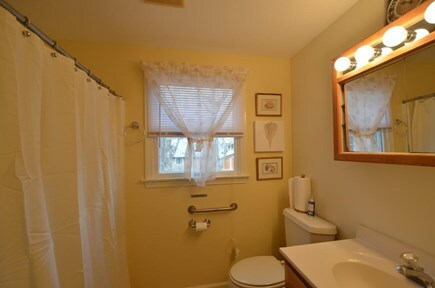 First floor bathroom features built in seat in shower, convertible shower head that can be used handheld, and safety rail. This property was the perfect getaway! Cozy, warm, inviting and comfortable. The house is located between Oak Bluffs and Vineyard Haven making the ideal location walkable to beaches and shops on Circuit Ave. The house is beautiful and perfectly maintained. I recommend this home for all who want a home away from home for their Vineyard vacation. I thankfully chose this home to celebrate my 50th birthday with family and friends. The house is well maintained, centrally located and has two spacious bedrooms upstairs. We enjoyed cooking out in the backyard, and walking or jogging into Oak Bluffs every morning. Great choice for anyone looking for a temporary home away! 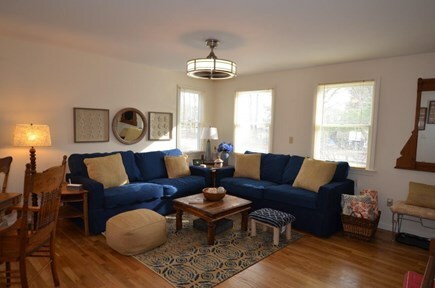 We hope you enjoy renting our family home on Martha's Vineyard! We've spent summers here for close to 30 years and love the relaxed atmosphere and cherish the family memories we've made. We think you'll make some special memories in our home too. Our home is in a wooded area, but is just off New York Ave which can take you quickly to either Steamship Ferry or the Island Queen in OB. 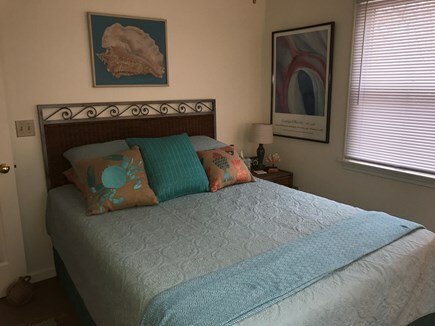 In fact, our house is about a 15 minute walk from the Oak Bluffs ferry, Oak Bluffs Harbor, Circuit Avenue and the beach. Our location makes it convenient for teens without cars to get around, or for visitors to get to the house if not bringing a car over!